Previously in 2012, if I debugged in Chrome (for example), and then stopped the debugger, the website would remain running in IIS Express. This no longer seems to be the case in 2013. Is this a new change that I need to make? How can I keep the website instance running even after I stop the debugger? Thanks. Turning off the new "Enable Edit and Continue" feature fixed it for me. Uncheck "Enable Edit and Continue"
You can also turn it off on a per project basis. Update 2: Blog article that discusses this feature. From Debug menu select Start Without Debugging or Ctrl+F5 to run the project, it will keep running your project unless you quit IIS. Christian: You don't need to turn the option off for IIS express to keep running. All you need to do is instead of stopping your application, detach all processes. If you go: Tools > Customize > click the commands tab. Then select toolbar radio button and on the drop down next to this select debug. You then want to "Add Command…". On Add Command window select debug and scroll down to and click on "Detach All". Click OK and then just close. You will see a red cross next to your debug menu. When you click this after debugging your application IIS Express will continue to run. Not the answer you're looking for? Browse other questions tagged visual-studio debugging visual-studio-2013 or ask your own question. 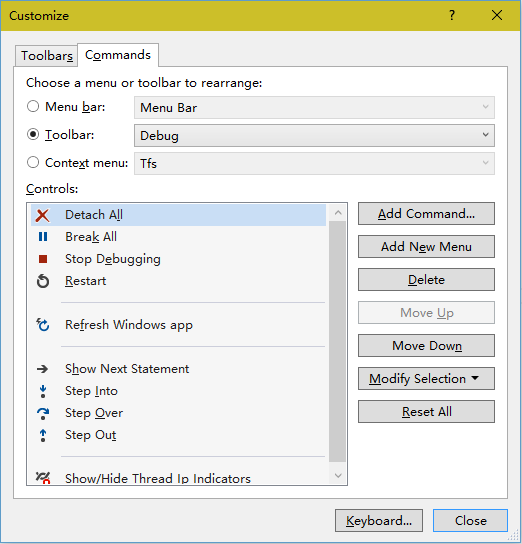 How can I prevent visual studio 2015 from closing IIS express app when end debug? Why is IIS exiting with code 0 whenever I preview in Chrome from Visual Studio? How to terminate script execution when debugging in Google Chrome?